As we get closer to Advent, the season in the Christian year when we look forward to the arrival of Christ, I have been thinking about faith. Faith is what opens up a relationship with God, but what is faith? I know many people who run to Romans 4 to talk about faith as opposed to working. Faith is belief, working is trying to earn your place with God. Abraham is justified, or made right with God, by his faith and not by what he did. God gave circumcision, the beginning of the Covenant, after Abraham was counted as righteous because of his faith. This is all true, but it is not all there is to the story. Abraham had to have enough faith that it changed how he lived. He had to believe that the God who was speaking to him was actually divine and would live up to His promise, and then he had to prove that he believed it by leaving his father’s house in Haran and going to an unknown land because God said to go (see Genesis 12). This passage speaks very strongly about Abraham’s faith, but it was faith that led to action. Sarah was not Mary. Isaac was not miraculously conceived without a father. He arrived in the world in the normal way. Abraham had to have enough faith in God that at 100 years old, he and Sarah tried to have Isaac. If our faith is not strong enough to change the way we think, live, act, and react in the world, then it is no faith at all. This is why James can write with confidence that “faith by itself, if it does not have works, is dead” (James 2:17). Interestingly, “faith by itself” in Latin is sola fides. This was one of the hallmarks of the Reformation and one of the reasons why the issue of faith versus works is such a hot topic, even today. And interestingly enough, this verse in James is the only place in the entire Bible where the phrase “faith alone” is used. We would be well to remember that faith alone can never save, because we have to have faith enough to change how we live. If Abraham had faith alone, Isaac would never have been born and Paul’s entire theology of salvation coming through the promise would be gone, not to mention the fact that Paul would never have been born since the Twelve Tribes of Israel would not have been born since Jacob would not have been born. The next time you stop and think about salvation by faith, ask God what the Isaac is in your life that He is planning for you, provided your faith is strong enough to change how you act. I would usually take this sentiment as a given since Jesus defeated sin and death in his crucifixion and resurrection. What took me by surprise was that Jesus said this in Chapter 16 (verse 33 to be exact). This is before his betrayal and arrest, let alone the crucifixion and resurrection. This means that Jesus thought of overcoming the world in much different terms than I did. Up to this point in the Gospel Jesus has healed lots of people, preached numerous sermons, and angered the religious establishment. 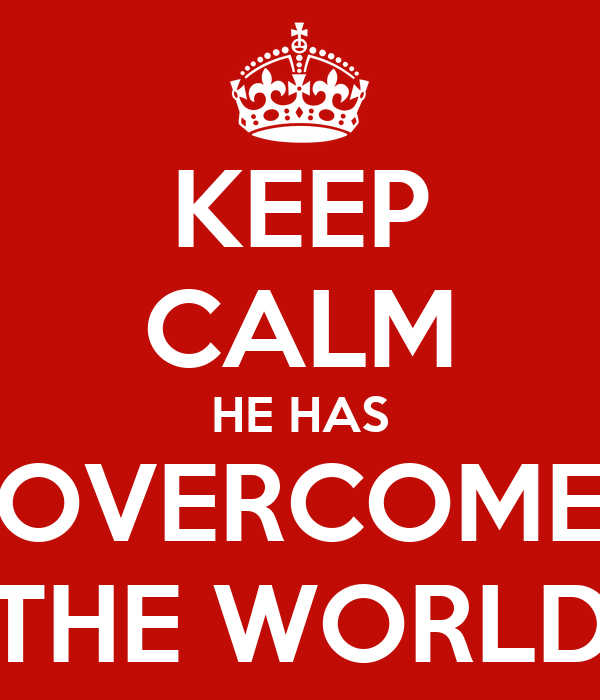 And it is here that Jesus says he has overcome the world. Perhaps overcoming is more about being in the fight against sin than the final victory. After all, God only ever asks us to fight against our temptations and sins. He gives us his power and grace, through the Holy Spirit, to overcome our sins, but we have to be willing to fight. Sometimes we fail and fall into sin, but if we are truly repentant, there is forgiveness. The truth is, though, God knows we will sin. And heloves us anyway. Notice when Paul writes his final thoughts to Timothy before he is martyred (2 Timothy 4:7) he says that he has “fought the good fight,” not that he had ceased sinning. When we fight against sin and temptation in our lives, and we ask God for help in not succumbing to those temptations, we will begin to experience more victory. We will begin, like Christ, to overcome the world through the fight. You are the Creator, Sustainer and Ruler of all creation. As the Alpha and Omega, you are the beginning and the end and you know all things: past, present and future. We, gathered here today, and around our country, thank you for providing us a nation such as this where we can practice our faith openly and pray to you in public. And we thank you for all those who have served in the military, both volunteer and drafted, they and their families, for their service and their sacrifice. As we gather on this Veteran’s Day, we are reminded as well that this holiday was set aside as Armistice Day, a day to commemorate the end of what was called the “War to end all wars” almost 100 years ago, and that we have had generations of veterans since then. Therefore, Lord God, Prince of Peace, help us not only remember and honor our veterans, but let us also—with your help, grace and guidance—work together so that there will come a day when there will be no more wars to create more veterans because your rule of peace will reign throughout our land and all lands. As we look back and honor those who have preserved our peace today, let us look forward to the day when everlasting peace will be ours. Thank you, Lord, for our veterans, and help us live lives of peace worthy of their sacrifices for us. God our Father, we offer this prayer to you in the Name of our Lord Jesus Christ, and in the power of the Holy Spirit. Amen. The word conjures up many different images for people. Sweaty palms and awkward looks. Bible-thumping, red-faced angry people. Something other people are supposed to do. Evangelism is not sharing an encyclopedic knowledge of Christianity for the past 2000 years. Nor is it telling people how horrible they are. Every encounter Jesus had with sinful people who were on the outs with the religious establishment of the day showed Jesus speaking in a loving and compassionate way to them. He intentionally went to those who were the dregs of society and offered them the reality that they were worth something because they were created in the image and likeness of God. They could be reconciled to God and have a whole life because of God’s grace and love. To be sure, “Go and sin no more” is a part of the message, but it is always preceded by love and forgiveness. The only times Jesus gets irate and speaks of judgment is when he is speaking to the religious folk who won’t see all people as God sees them. Jesus is outright condemnatory to the scribes and Pharisees who do not offer hope and love to those around them. If anyone is a Christian, that person is an evangelist. We may not all have the spiritual gift of evangelism, but we are all evangelists nonetheless. This is because we are all missionaries. We live in a world that is still not fully and completely the Kingdom of God on earth as it is in heaven. Therefore, we have work to do as missionaries. Live lives in love towards others, no matter who they are. Be willing to sacrifice even your reputation to do so. But don’t leave your efforts at evangelism as simply “showing people Christ by how you act.” This is important, but it is not enough. We also have to be able to articulate our faith. We need to be able to talk about Jesus with people. If we live Christian lives but never talk about Jesus, people will think we are nice. If we talk about Jesus but do not live Christian lives, people will think we are hypocrites. We need to be able to both live a Christian life of love and grace, and also be able to talk about our faith and who Jesus is. That’s when real evangelism happens.